Emergency procedures must be in place and practiced to ensure safe evacuation in the event of a fire or power loss within a building according to Irish Standards 3217 2013.Employers are required by law to prepare and revise adequate emergency plans and procedures and provide the necessary measures for evacuation and fire fighting of the workplace and to include adequate escape lighting in the event of a fire and power loss. the size of the workplace, its construction, layout, contents and the number and width of the available escape routes. All workplaces must have clearly identified means of escape in the event of fire. 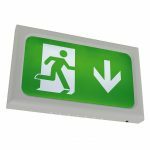 These escape routes must be kept clear at all times to ensure that everyone can exit the workplace in the event of a fire or other emergency. Take care if placing notice boards in escape corridors/ routes as any paper on the board could be fuel in the event of a fire. Arrangements must be conveyed to all those occupying the workplace and particularly to personnel such as fire wardens who will be assisting in overseeing any emergency evacuation. To understand what type of emergency evacuation routes might be needed, consideration should be given to the relevant Building Regulations. Fire detection, emergency lighting and emergency egress must also be addressed. 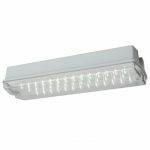 Regulations require that “emergency routes and exits requiring illumination are provided with emergency lighting of adequate intensity in case the lighting fails”. 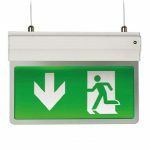 Two standards from the National Standards Authority of Ireland (NSAI) deal with the issues of Emergency Lighting (I.S. 3217) and Fire Alarm Installation (I.S. 3218). In addition guidance can be obtained by consulting standards, such as BS 5588 and BS 9999, which deal with the specific area of fire. As part of your fire risk assessment you, the employer, should consider whether, in the event of a fire occurring, all persons in the premises could leave safely and reach a place of safety. If the premises is small and has a simple layout, the normal entrances and exits may be sufficient. There should be no possibility of anyone being cut off by smoke or flames before they can make their escape. Where the building increases in size and complexity, escape routes need to become more sophisticated. The general rule is that people should be able to turn their back on a fire, wherever it may start in a building, and move away from the fire to a safe place. Usually this means outside the building and a safe distance from it in case the fire grows (i.e. not into an enclosed yard, courtyard, etc.). Where there are two or more escape routes, care should be taken to ensure that smoke and flames cannot affect more than one escape route at the same time. Escape routes should be kept clear of all obstructions. Generally, escape routes should be at least one metre wide. The escape route should lead to a place of safety, normally outside and away from the building. Doors on escape routes must always be available for use without the use of a key. When considering the escape routes from a place of work, an employer must be sure that that he has evaluated the entire journey to a place of safety. All routes must be kept clear, including areas outside the premises that are included in the escape route. Employees must be made aware of all possible escape routes and emergency drills should be used regularly to practice using them as part of emergency routines. All premises should have an escape plan that clearly identifies the action that employees and others should take in the event of a fire. This may include duties for employees to check areas are clear, close doors and assist others. Building Regulations 2010 – Technical Guidance Document M – Access and Use provides useful advice. Also see Promoting Safe Egress and Evacuation for People with Disabilities (138 pages), the Risk Assessment Checklist and the Personal Emergency Egress Plan from the National Disability Authority. When specific escape routes are provided that do not form part of normal circulation routes it is important that employees are made aware of these. A management system should be in place to ensure these routes and exits are kept clear and usable.